From 27 February to 21 March, 2012, La Escalera de Jacob presents its V Jazz Festival dedicated to flamenco. 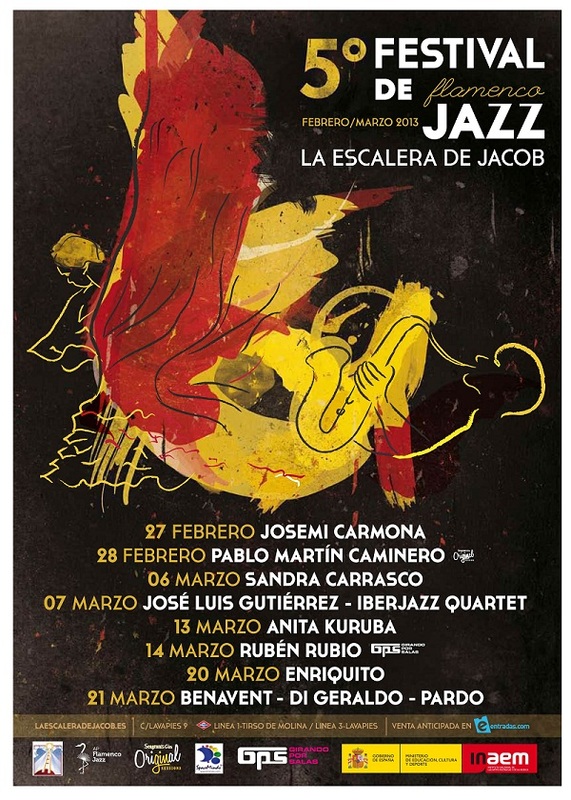 For the fifth consecutive year, the emblematic cave of La Escalera de Jacob hosts its Jazz Festival in a new edition that is dedicated to Flamenco-Jazz. La Escalera de Jacob aims to promote and spread the work of Spanish artists who, from their depth and rigor, have been able to combine the spirit of the most iconic of Spanish music with the richness of a genre that was created in the U.S. but yet is full of African, Latin American and Hispanic rhythmic components and resonances. On the 27th of February, in a place as intimate as the Magic Cave of La Escalera de Jacob, the guitarist Josemi Carmona´s strings will open a cycle that brings together outstanding artists who explore the relationships between flamenco and jazz. Pablo Martín Caminero, Sandra Carrasco, José Luis Gutiérrez, Anita Kuruba, Enriquito, Carles Benavent, Tino di Geraldo or Jorge Pardo are some of the musicians who will share this expressive richness of a musical blend full of creativity and vitality in the festival. In addition, thanks to El Circuito de Músicas Populares Girando por Salas(The Circuit of Popular Musics Touring Concert Halls), one of the Spanish bass players with the greatest rising impact on a national level, Rubén Rubio, will be brought on stage with his quartet. This year once again the program collaborates with the consultancy company SpaceMinds, plus different brandnames supporting jazz like Seagrams who solidly develop and carry out the Seagrams Original Sessions within the La Noche en Vivo,The Association of Live Concert Venues in Madrid “The Live Night”. Besides this, for the first time this year,recently created association Asociación para la Promoción del Flamenco Jazz, will be joining the festival. The association dedicates to promote flamenco-jazz both in Spain and abroad through diverse activities such as an organized series of concerts, training activities, and activities that help to strengthen the emerging and already established values and traditions of Spanish Flamenco–Jazz in general.